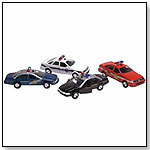 Toys that roll, zoom and fly are always popular, and these fun die-cast toys are no exception. Specialty retailers interviewed by TDmonthly Magazine in August 2014 reported that Matchbox and Hot Wheels cars, along with classic die-cast school buses, were still driving big sales. You can learn more about their best-selling die-cast toys below. 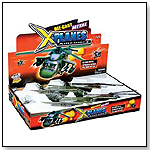 Show Flight Bi-planes Die-cast Model Airplanes by TOY WONDERS INC.
Kinsmart - School Bus 5" by TOY WONDERS INC.
Kinsmart - Ice Cream Die-castTruck (5", Asstd.) by TOY WONDERS INC.
5"L x 1.875"W x 2.75"H diecast metal vehicle with pull back action, openable doors and detailed interior. This Ice-Cream truck is manufactured by Kinsmart/Kinsfun Toys. 12 pcs per display in assorted colors. 72 pcs per inner box. — Tim Holliday, owner of Children's World and Uniform in Sarasota, Fla., told TDmonthly in an August 2013 survey that police cars and ice cream trucks are their best-selling die-cast items. — In a August 2014 survey, three out of 10 retailers told TDmonthly that Toysmith made their stores' best-selling die-cast toys. RC2 ERTL John Deere - 4630 Farm Tractor Dealer Edition 1:16 scale die-cast collectible model by TOY WONDERS INC.
15073 RC2 ERTL John Deere - 4630 Farm Tractor Dealer Edition. 1:16 scale diecast collectible model. 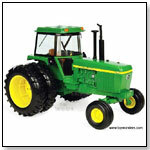 This 4630 Farm Tractor is a 10.5"L x 10"W x 7.25"H die-cast tractor. Individually packed in a window box. Box size: 12.75"L x 8"W x 9.25"H. This 4630 Farm Tractor is manufactured by RC2 Brands. Item 15073 is in GREEN color. — Mary Whitbrod, owner of Imagination Station in Toledo, OH, told TDmonthly in an August 2014 survey that "Anything John Deere" is their store's best-selling die-cast. SUN STAR Mini - 1961 Austin Se7en Cooper Hard Top 1:12 scale die-cast collectible model car by TOY WONDERS INC.
5303 SUN STAR Mini - 1961 Austin Se7en Cooper Hard Top. 1:12 scale diecast collectible model car. This Austin Se7en Cooper is a die-cast metal car with openable doors, hood & trunk. Limited edition 1 of 999 pcs with numbered certificate. Manufactured by SunStar. Item 5303 is in SMOKE GREY-GREEN color with Old English White roof. Individually packed in a box. Box size: 12.5"L x 7.25"W x 6.25"H. Launch date: February 7, 2012. — In a August 2014 survey, Charles, manager of Miller's Toys in Mamaroneck , N.Y., told TDmonthly that Mini-Coopers are one of their store's best-selling die-cast toys. Hot Wheels 2014 Off-Road Daredevils Red Monster Dairy Delivery by MATTEL INC. This Hot Wheels car is red and features blue, white and black designs. — David Stelzer, owner of Shananigans Toy Shop in Baltimore, Md., told TDmonthly in an August 2014 survey that Hot Wheels is one of his store's best-selling die-cast toys. Helicopter toy. US Army Blackhawk markings. Pull back action. Die cast. Assorted designs. — Mary Porter Green, owner of Curiosity Zone in Ashburn, Va. told TDmonthly in an August 2014 survey that Toysmith Helicopters are one of her store's best-selling die-cast toys. 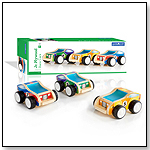 MATCHBOX® 3 Pack by MATTEL INC.